Because of its location, volume, speed, and propensity for severe flooding, the Rhône, France’s most powerful river, has long influenced the economy, politics, and transportation networks of Europe. Humans have tried to control the Rhône for over two thousand years, but large-scale development did not occur until the twentieth century. The Rhône valley has undergone especially dramatic changes since World War II. Hydroelectric plants, nuclear reactors, and industrialized agriculture radically altered the river, as they simultaneously fueled both the physical and symbolic reconstruction of France. 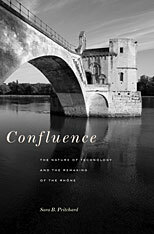 In Confluence, Sara B. Pritchard traces the Rhône’s remaking since 1945. She interweaves this story with an analysis of how state officials, technical elites, and citizens connected the environment and technology to political identities and state-building. In the process, Pritchard illuminates the relationship between nature and nation in France. Pritchard’s innovative integration of science and technology studies, environmental history, and the political history of modern France makes a powerful case for envirotechnical analysis: an approach that highlights the material and rhetorical links between ecological and technological systems. Her groundbreaking book demonstrates the importance of environmental management and technological development to culture and politics in the twentieth century. As Pritchard shows, reconstructing the Rhône remade France itself.